Convert FLV to MP4 and other 1000+ video formats without losing quality. Edit FLV files with trimming, cropping, rotating, adding watermarks, applying effects, etc. Transfer converted videos to iPhone/iPad/Android devices easily via a USB cable. Burn FLV to playable DVD with free DVD menu templates. Usually, there is a need to convert files from their existing FLV format into the more compatible MP4 format. Earlier, FLV held a popular position on the Internet for video format due to the availability of Adobe Flash plug-in. However, with advances in browser technology and Flash plug-in, the FLV format began losing its place. Video hosting services rarely use FLV now and have turned to MP4 as the new standard video format for the web. That's why so many users are looking for FLV to MP4 methods. MP4 format helps users with high-quality video content and the luxury of compression, thus reducing file size. 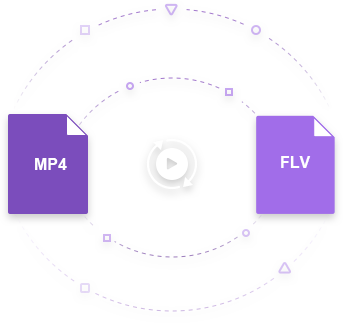 It's widely used in almost all devices and websites, so if you have the needs to convert FLV to MP4, read this articles to learn the best FLV to MP4 video converter and free online solution. Wondershare UniConverter (originally Wondershare Video Converter Ultimate) can be downloaded from its official website. The application can be downloaded for Windows and Mac. It converts to various video formats, one of them being MP4. The converted file can be used with different devices like Apple, Samsung, etc. There is no loss of quality and additional enhancement for the converted file. Also, this converted works at a speed that exceeds the speed of all other converters by 30 times. Directly convert FLV to MP4, AVI, MKV, MOV and 1000+ other formats. Burn FLV videos to DVD with free menu templates and play with your DVD player. Convert FLV to MP4 at 30X fastest speed and without losing quality. All-in-one toolbox with functions like video compressor, DVD/CD burner, GIF maker, fix video metadata, screen recorder, etc. Once you have completed the installation process after downloading the converter from the website or the link above, run the program on your computer. Drag and drop the FLV files you wish to convert from your system directly, or you can click the Add Files button to open the file browser. You're allowed to add files from devices directly. Once the FLV files are added to the program, you can opt for the edit options under the video thumbnail to modify your source video. 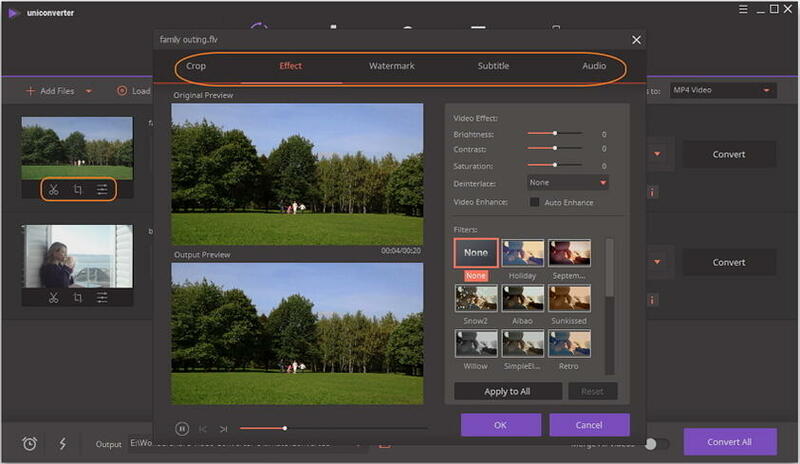 You're allowed to trim, crop, and cut videos, or add watermarks, apply effects, edit subtitle to the video with real-time preview. Click on the Convert all files to: option to open the drop-down list, then choose the Video tab and select MP4 as your output format, also choose the desired resolution. Once you have saved the changes, click on the Convert All button to start converting FLV to MP4 on your PC/Mac. You can find your converted files under the Converted tab. 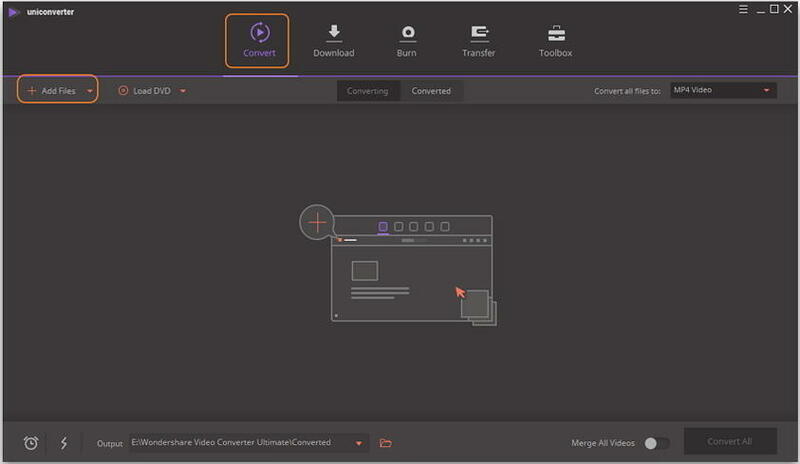 Wondershare Free Video Converter allows you to convert videos into any format for free, including FLV to MP4 free conversion. With enough clarity and features, this converter can be downloaded from Wondershare with ease. The installation process is fairly easy. 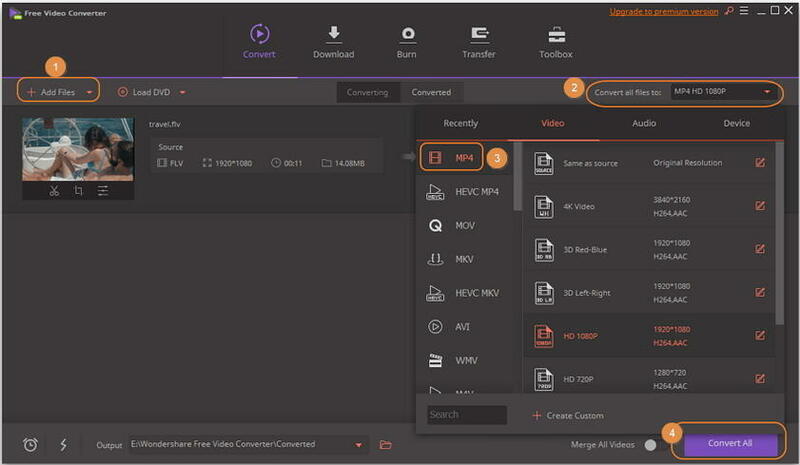 Also, the converter comes with a wide array of features, allowing users to experiment with their video formats. Offers a fast conversion speed that outshines many free converters in the market. Easy-to-use interface and clear functions with high-quality output. Single YouTube video downloading option is integrated into the converter. 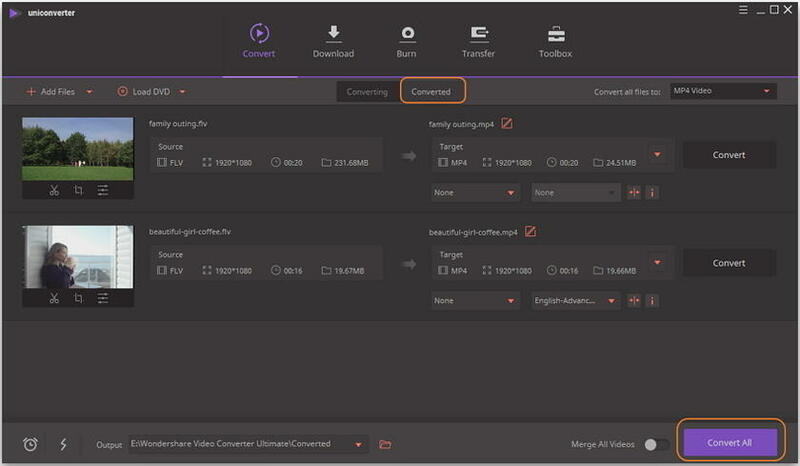 As the free version of Wondershare UniConverter (originally Wondershare Video Converter Ultimate) we recommended in Part 1, FLV to MP4 conversion can be done easily on Wondershare Free Video Converter with similar steps. Or you can download and install it and follow the easy introduction below to convert FLV files to MP4 for free. Step 1: Open Wondershare Free Video Converter after installation, and click the Add Files button to select and add the FLV video you want to convert to MP4 for free. Step 2: Choose the output format as MP4 from the Video tab, which can be found in the Convert all files to: drop-down format list. 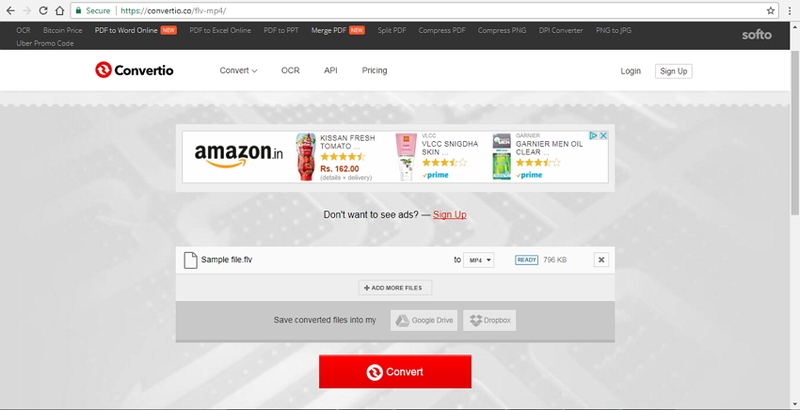 Step 3: Click on the Convert or Convert All button to convert FLV to MP4 free. The process takes a few minutes according to your video length. To learn more free FLV to MP4 converters, you can read the recommendation about the Top 5 Free FLV to MP4 Converters for Windows/Mac >>. Online Converter proves to be a decent option when you have basic file conversion needs. These online programs are cloud-based and need no download or installation. One such popular cloud-based online converter is Convertio. This program works with Windows as well as Mac system and supports a wide range of formats for conversion. The program allows adding files from your PC, URL, Dropbox or Google Drive. The maximum of up to 100MB file size can be uploaded to the software interface for conversion. Multiple files can be added to the converter, and the files can be saved to Dropbox, Computer or Google Drive once converted. Step 1: Open https://convertio.co/flv-mp4/ on your PC browser. Step 2: Add FLV files from your PC, Dropbox, or Google Drive to the software interface. Step 3: Hit Convert to start the conversion process. The download link for the converted file will be available on the program interface to download a file. With a few simple steps of this FLV to MP4 converter free, get your desired file. Online converters are free and simple to use, but the solution is not as professional as desktop software like UniConverter. The Below listed table shows the comparison between Convertio and the software. Flash Video (FLV, F4V) is a container file format used to deliver video over the Internet using Adobe Flash Player versions 6-11. Flash Video content may also be embedded within SWF files. There are two different video file formats known as Flash Video: FLV and F4V. The audio and video data within FLV files are encoded in the same way as they are within SWF files. MP4 is a container format used to store video, audio, and subtitles data. Since stores like iTunes uses this container format and it is used with iPod and PlayStation (PSP). It becomes a popular format.